This time it was Uzes. One of my favourite towns in the whole wide world….and it knows it. I always seem to fall in love with everything I see in Uzes so when we heard there was a 2 day antiques fair and market, it was bound to be trouble. Had we all the money in the world and an enormous french farm house to fill, it would have been a breeze, but we haven’t and we don’t so we were frugal and careful but still found some treasures. 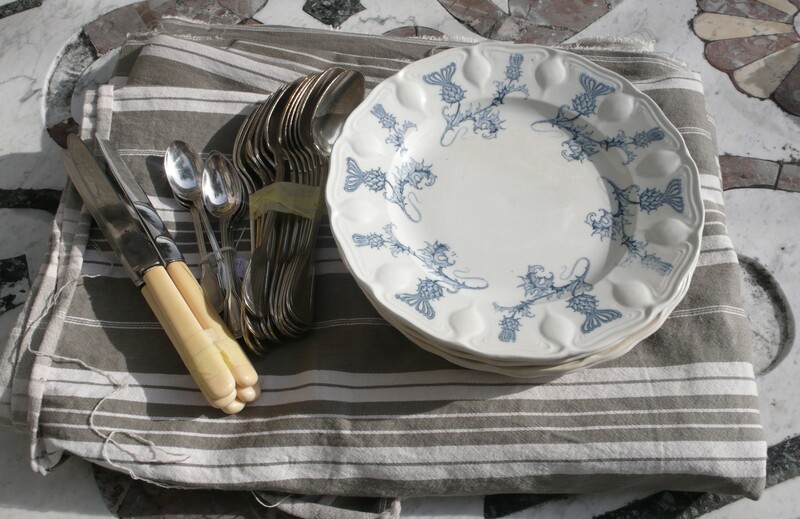 My finds were as follows : a 6 piece set of matching plates, a bundle of fabulous french stripe fabric and some silver and bone handled cutlery – 6 of each utensil and all in pristine condition. 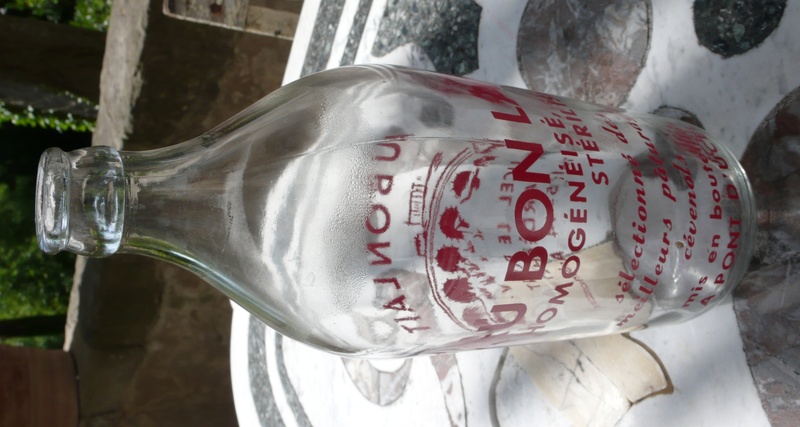 My husband – having a bit of a thing for milk and glass bottles – found this gorgeous one which will sit on a shelf with the 35 American glass milk bottles he shipped back last year. A man can never have too many milk bottles. To celebrate our brocante brilliantness we went out for dinner, sans children, to a wonderful restaurant called Le Tracteur in Sanilhac – Et – Sagries. It’s on a little back street of this very sleepy village with no signs, no menus out front and just a small garden with enough tables and chairs to seat 40 comfortably. It’s full every single Summer night and the food is simply a treat. The very clever chef, who works the kitchen with no help at all, devises a changing menu which offers a choice of just 2 starters, 2 main courses and 2 deserts or cheese, all for 27 euros. We come here every year and have learned to totally trust anything which is put in front of us and therefore always choose one of each course to share – or not to share, depending on who made the best choice. Everything is seasonal and local and more often than not, there are foods and flavours I’ve never tasted before but which I wish I could recreate and eat all the time. We felt a bit silly taking pictures of all the courses and to be perfectly honest, we were too busy enjoying ourselves. Have a look at their Facebook page where there’s all kinds of lovely things to see and information to be stored.